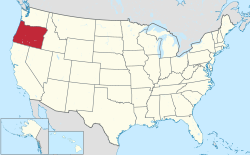 Oregon is a state in the United States. Salem is the capital (where most of the state government works), and Portland is the city with the most people. 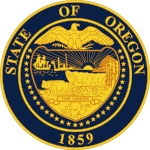 Oregon was the 33rd state to join the United States, in 1859. The state of Washington is to the north of Oregon. California and Nevada are to the south. Idaho is to the east. The Pacific Ocean is to the west. The Columbia River flows along most of the border with Washington. The Snake River flows along much of the border with Idaho. The highest mountain is Mount Hood (11,237 feet or 3,425 metres high), part of the Cascade Range of mountains. Another famous Cascade Mountain in Oregon is Mount Mazama, better known as Crater Lake. Oregon was a long way from the United States of America, which was east of the Mississippi river in the 1830s and 1840s. To get to Oregon, settlers had to cross the Great Plains, which were empty except for a few forts and groups of Native Americans. Most people thought that it was impossible to farm there. They called it the "Great American Desert", because crossing it was long and dangerous; however, thousands did anyway. Mountain men (people who knew a lot about living in mountainous places) had found a passway over the Rocky Mountains, and they named it the South Pass. This path helped many wagons to reach the west coast. In 1836 a missionary named Marcus Whitman crossed through the pass with his wife to Oregon. This proved that it was possible for others with women and families to go too, and because of this, Oregon suddenly became the place pioneers wanted to make a trip to. Most of the settlers that came by the Oregon Trail had a very difficult trip. The Trail began in Missouri, and they went in covered wagons pulled by animals like bulls. They could only travel 100 miles in one week, and so the whole trip would take half a year. But still, lots of pioneers traveled so much that it is still possible to see the wagon ruts in some places today. Life on the trail was very hard for the pioneers. Every day, they would break up and camp, travel all day, and set up camp again. Food was usually beans and coffee, for every single day of the trip. The travelers always searched for water, wood for fires, and something to catch and eat fresh. But these were hard to find, and so sometimes they got mad at each other and fought with fists and guns. The Trail was also dangerous. Rivers could flood, washing away people and other things. Native Americans could attack, oxen or horses could die, and diseases and injuries could strike. By 1840, due to all the hard work of the pioneers, there were thousands of Americans in Oregon. Towns and farms had been set up. The area was part of British North America at the time. But the British, however, only had a few hundred settlers in Oregon. Because of this, the Americans began to plan to take over the whole land. Many Americans wanted this as well. They made up the slogan, "Fifty-four Forty or Fight!" and wanted all of Oregon up to latitude 54 or they would go to war with Britain to get it. They were so eager to have Oregon all for themselves, they supported James Polk as president because he claimed to have similar thoughts with them as well. However, after President Polk was elected, he began to be more sensible. He did not want to wage war with Britain, if it could be avoided. The British also realized that the Americans would soon have enough settlers in Oregon to easily drive out the British defenders. In 1846 the British offered to divide Oregon by giving most of the border land between the USA and what is now Canada. President Polk accepted this, and so now the Americans had power over Oregon as well as the other states. There are a number of colleges and universities in Oregon. The four-year universities with the most students are Portland State University, Oregon State University, and the University of Oregon. ↑ Hall, Calvin (January 30, 2007). "English as Oregon's official language? It could happen". The Oregon Daily Emerald. Retrieved May 8, 2007. ↑ "Idaho is Nation's Fastest-Growing State, Census Bureau Reports". U.S. Census Bureau. December 20, 2017. Retrieved January 30, 2018. ↑ "Median Annual Household Income". The Henry J. Kaiser Foundation. Retrieved December 9, 2016. ↑ "Mount Hood Highest Point". NGS data sheet. U.S. National Geodetic Survey. http://www.ngs.noaa.gov/cgi-bin/ds_mark.prl?PidBox=RC2244. Retrieved October 24, 2011. ↑ 7.0 7.1 7.2 7.3 7.4 7.5 Buskey, Theresa K. History and Geography LIFEPAC. Alpha Omega. pp. 17/18. ISBN 978-1-58095-155-5.